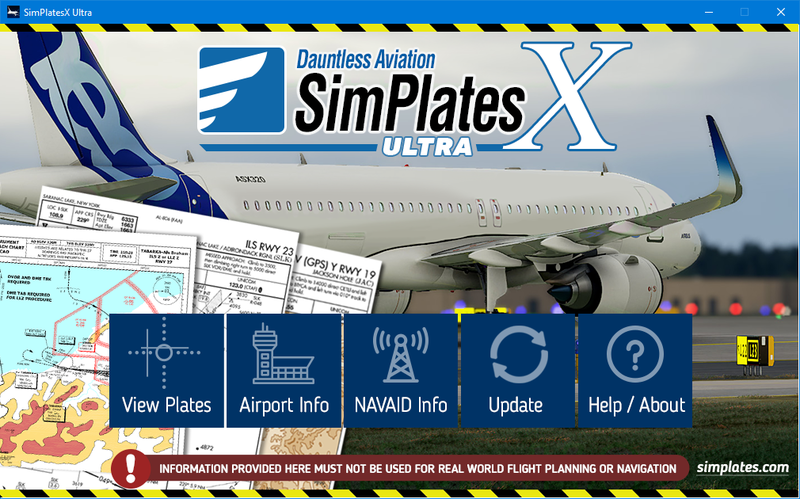 SimPlates ULTRA is the world's best collection of IFR approach (and other) charts and a worldwide airport/facility directory aimed at the serious flight simulation enthusiast. 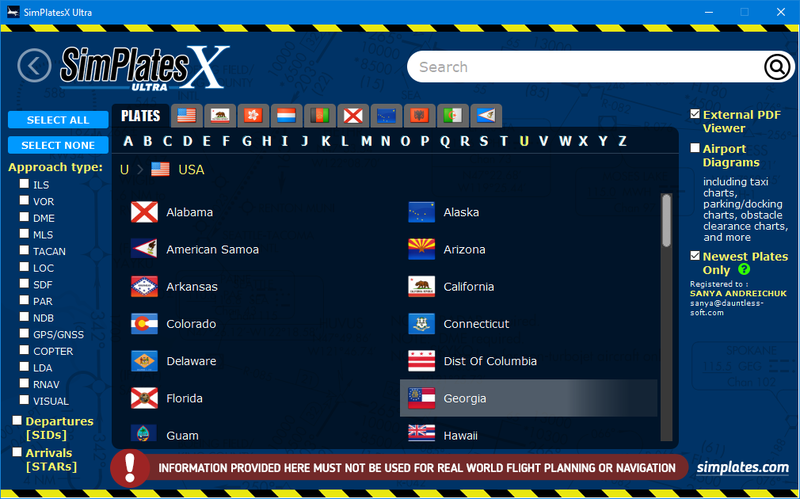 SimPlates X features over 70,000 REAL WORLD IFR PLATES - far more plates and at a higher quality than ever before. Trusted and loved by serious simmers the world over, SimPlates has won high praise from major flight simulation websites and magazines worldwide. Take your flight simulator experience to the next level! Over 70,000 real-world IFR plates, including approach plates, SIDs/STARs, Airport Diagrams, and more. Approach types include ILS, VOR, VOR/DME, NDB, LLZ, SDF, GPS, TACAN, Helicopter, Visual, and more. Complete, Integrated WORLDWIDE Airport/Facilities directory. Features useful information on the vast majority of the world's airports, including many tens of thousands without instrument approaches. Also included as part of this is a fairly comprehensive worldwide directory of NAVAIDs (Navigational Aids) such as VORs and NDBs. This is a massive collection of data, totaling over 100 gb. Because of the large size, SimPlates Ultra is no longer available on DVD as previous versions of SimPlates were. Rather, SimPlates Ultra programs/apps download content from our servers on an on-demand basis. Simplates' friendly interface makes it easy to find exactly the plate or information you are looking for quickly, and have it ready for your virtual flight. If you use SimPlates on a PC or Mac, you can print them out. 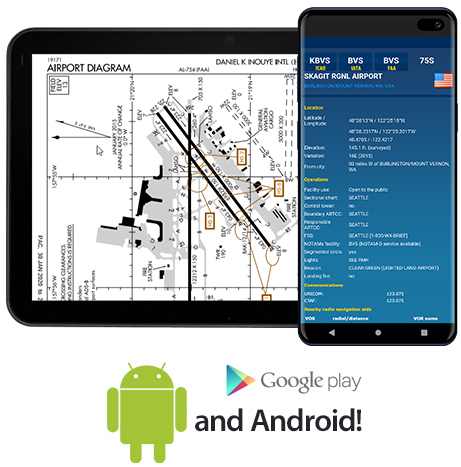 If you use them on a mobile device such as a tablet, you can use it directly from that just as real pilots do more and more. Remember, SimPlates are ACTUAL IFR PLATES! However, pilots, please avoid all temptation and DO NOT USE THEM FOR REAL WORLD FLIGHT. This is because actual IFR plates have relatively short life spans, and thus the plates in SimPlates should be considered expired. However, they are still more than perfectly valid for simulator flying. SimPlates is available in downloadable (immediate download) format. 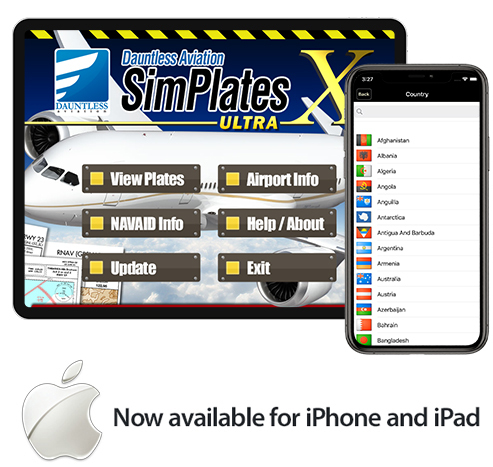 SimPlates is available for PC, Mac, iPhone™ and iPad™ and Android. IFR plates are basically little charts that real-world pilots reference while flying. They are not en-route charts, which are the larger sort of charts roughly analogous to large-area road maps for automobiles. Rather, IFR plates are basically guides to some of the most critical phases of flight, such as taxi, departure, arrival, and (especially) approach to landing. When most people think of IFR plates, they think of approach plates, which contain the series of steps and navigation and communication frequencies that a pilot must reference when flying an instrument (or visual) approach to an airport. For example, when flying on an ILS (Instrument Landing System) approach to a runway at John F Kennedy International Airport in New York or Hong Kong or Heathrow or Schiphol, you need to know what the proper ILS frequency is, what the missed approach procedure is, and what the critical altitudes are for all phases of the approach. Flying an approach properly is hard - in the beginning you may be overwhelmed. But learning to do this is a great way to raise your simming enjoyment and professionalism to a really high level. And, of course, you need approach plates to be able to do this properly. 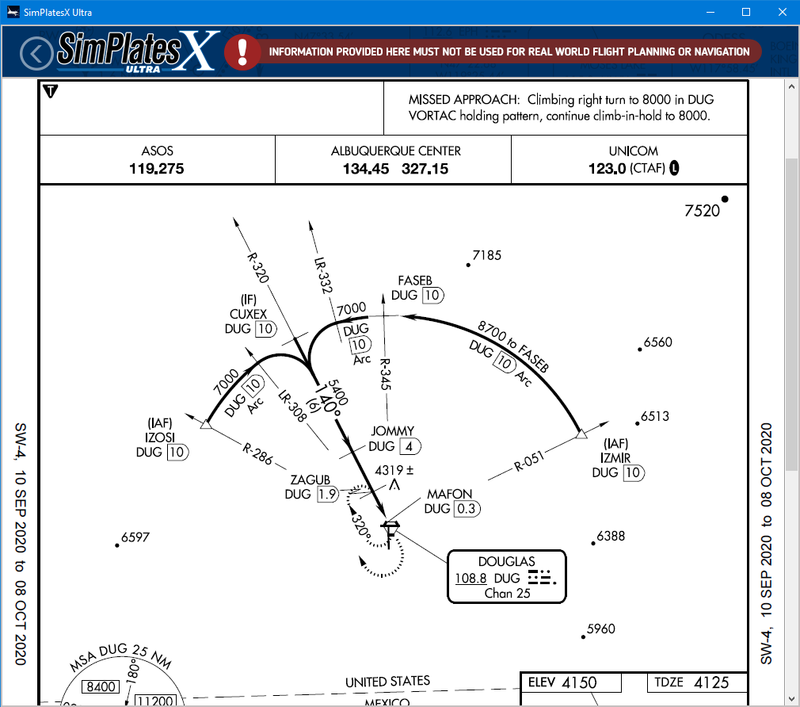 There are other plate types in SimPlates, including SIDs/STARs (Standard Instrument Departures / Standard Terminal Arrivals) and Airport Diagrams. 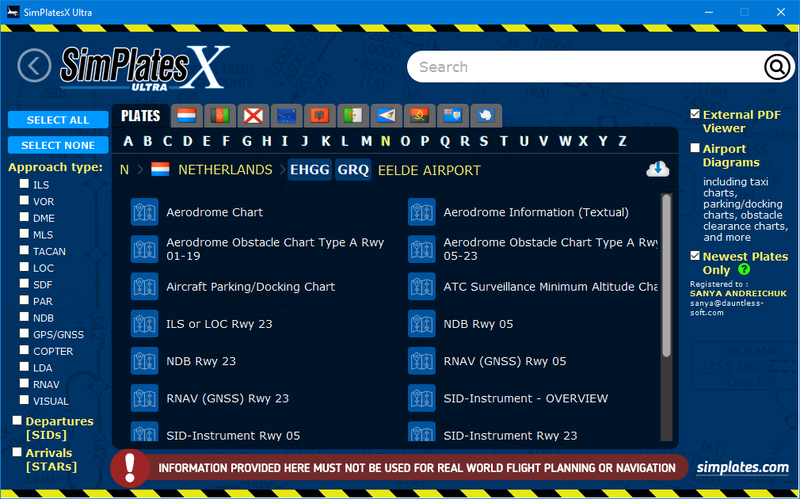 But IFR approach plates are available on the web, free! Yes, some are. However, you'll be hard pressed to find anywhere near the breadth and depth of coverage that Simplates includes. Check out the see complete list of included airports to get an idea. With SimPlates, you're generally only a few moments away from accessing out any plate that you want, and there are many thousands of plates also that are simply not available on the web at all. 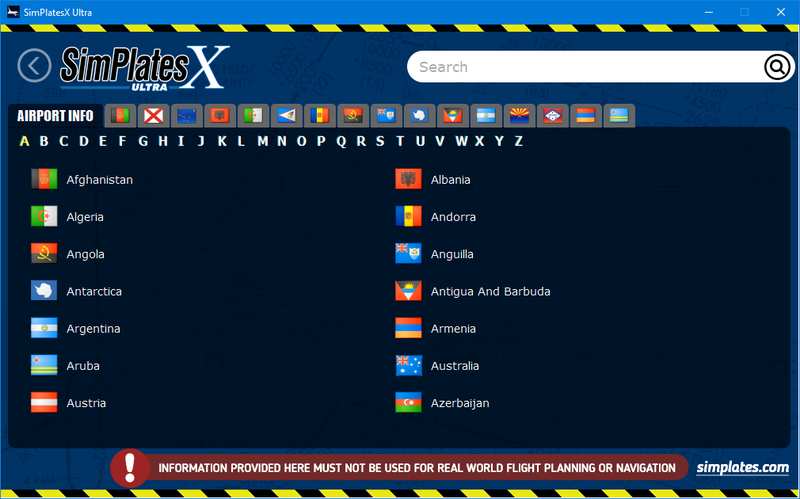 Simplates is unique in that it contains plates not just for the USA, but for dozens of other countries as well. Are these the same as Jeppesen™ plates? Jeppesen is a private company that makes many worldwide approach plates. Some pilots use Jeppesen plates, some don't. The plates included in SimPlates are NOT Jeppesen plates, but are mostly government-issued plates that have fundamentally the exact same data on them. Again, the plates included with SimPlates are generally real-world plates. SimPlates has a much wider coverage area than the (at the time of this writing) very outdated Jeppesen simulator plates product. How does SimPlates compare to another company that I saw online that offers online approach plates for flight simulator users? SimPlates costs much less, has far greater plate coverage, does NOT require you to purchase a recurring subscription as they do, and has a superior (faster/easier) user interface. Additionally, SimPlates is available natively for mobile platforms. In short, we think we provide a better product and far better value than they do in every way imaginable. What countries and airports does Simplates cover? Simplates covers MOST but NOT ALL of the world and is by far, by far, by far the largest most comprehensive collection of data of its kind. In some cases, some countries are covered in more depth than others. In some cases, not all possible plates for a given airport are included. To see the exact list of what is in SimPlates, click here. Please don't be "that guy" who ignores this list then complains about one of the few places where we don't have coverage. Why don't you have country or airport X? First of all, please again look at our airport/country/plate list. It's massive and is the result of many person-years of labour in obtaining, parsing, typing, and organizing the data. In fact, the content in SimPlates represents far more work than even major aviation data sources provide real world pilots astronomical fees. However, even so, we can't and don't provide 100% coverage despite our best efforts (for example, we've called, emailed, and faxed Pakistan and Egypt dozens of times without headway). In the case of 'country X' it's probably that we've tried but have been unable to source these in a way that we can include these in our app. A few countries like Pakistan, Ecuador, and bits of the Carribean and Afica (including Egypt) have been particularly problematic despite our best efforts. If you think you have a solution for us, we'll be happy to hear from you. The case of a missing airport is rare. Sometimes it's an oversight and sometimes there is a specific reason, like one obscure civil airport in China that we were explicitly asked not to include for reasons unknown. Please contact us politely if you think we're missing an airport that you think we can or should add. I see a plate in SimPlates with an old date on it. Often, this is because certain agencies don't update their charts often OR they continue to use old dates (even up to several decades old) UNLESS the plate itself changes. In some cases, we are contractually limited to the newness of the plate that we can offer sim users at the relatively very modest price. I heard that the USA plates in Simplates are always up to date. As of this writing and for the last several years, yes, this has been the case as our systems automatically generate updates at the time of FAA chart cycles. However, this feature is not advertised or guaranteed to go on forever. It might though. We just don't guarantee it. Occasionlly, when the FAA changes things there is a delay as we have to re-jigger things to make it work with the new FAA system. You're missing some obscure SID/STAR!. Yep, it happens. If you write to us in a spirit of mutual respect and civility, we'll be happy to do our best to update this (though we can never guarantee). Is SimPlates a flight simulator? I can't figure out how to fly it. 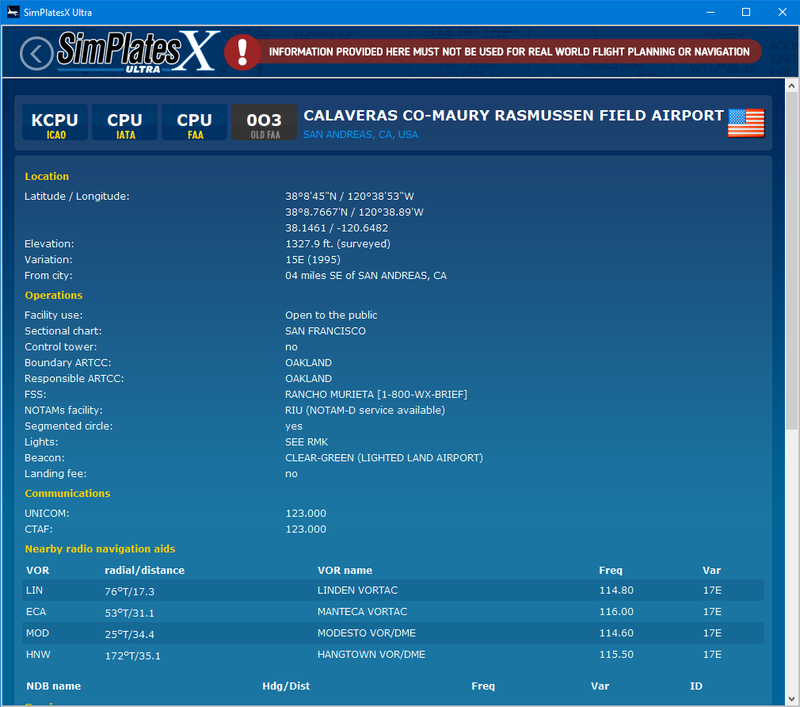 SimPlates is not a flight simulator. There's no way to "fly" it. Simplates is a companion app that works alongside (but does not directly integrate with) other flight simulator programs or environments that you may already have. If can make your flight sim experience more fun, challenging, and real. How does SimPlates integrate into my copy of Flight Simulator? It doesn't. Well, not directly. SimPlates is a standalone Windows / Mac / iPhone and iPad / Android program/app. You launch the standalone program/app, and use it to find exactly the plate you want. From there, you can either print out the plate (PC versions) or view it onscreen (PC and mobile versions). 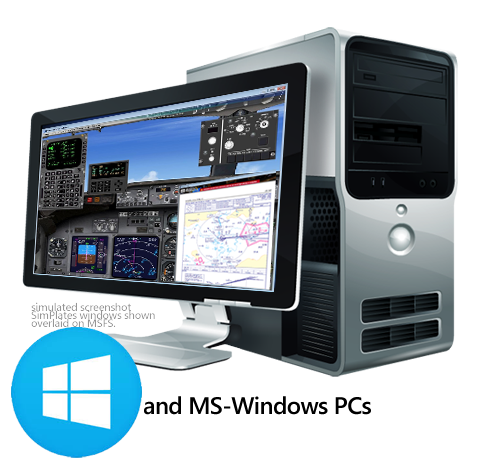 As such, SimPlates is compatible with, but does not directly integrate to, every PC flight simulator that features reasonably true-to-life NAVAIDs and approach systems. For most people, this means Microsoft Flight Simulator (MSFS) X, 2004, 2002, 2000, 98, etc. However, it also includes sims such as X-Plane, Flight Gear, Elite, ASA On-Top, and even some oldies but goodies like Flight Unlimited and Sierra Pro Pilot (ok we admit it - we just mentioned those last two to give your nostalgia sensors a nudge). Print? Why not just display them on screen? Well, you can if that works for you. This is especially true if you have a mobile or tablet version, as more and more real-world pilots are using tablets to view approach plates. I'm new to the world of approach plates and the like. Where can I find out more? If you're a real-world pilot, you might find some usefulness in our GroundSchool FAA written test prep software for IFR, RideReady FAA Oral Exam Prep software for IFR, our CanadaPilot INSRAT training software, or our GroundSchool UK IMC Test prep. Additionally, we are now working on a soup-to-nuts IFR tutorial program for IFR, though that is not yet complete. I'm a pilot. Can I use SimPlates IFR approach charts for my real world flights? 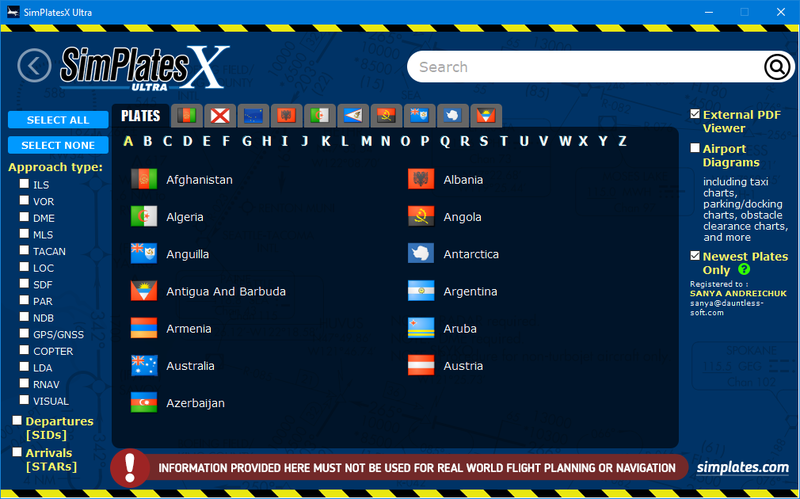 DO NOT USE SIMPLATES FOR REAL WORLD FLIGHT OR FLIGHT PLANNING. Why? While SimPlates are actual IFR charts, they are often out of date. This is just fine (brilliant, actually) for simulator use (I'd reckon that 99.97%+ of SimPlates are perfectly flyable on, for example, MSFS 2004 or X), but NOT for real-world flight, as flying real-world IFR by rule generally requires up-to-date charts, by regulation. Unfortunately, real-world always-up-to-date plates are very expensive. At the time of this writing, coverage for something like what simplates provides runs in the area of $1200 per 6 months. SimPlates is much, much less expensive! What are the sources of the charts? What about quality? The sources of the charts vary as does the quality. For the USA, the standard NIMA/NACO charts that most pilots fly IFR with are included. Additionally, there are a hundreds if not thousands of DOD/FLIP charts published by US military agencies for both the US itself and many foreign countries and territories. Additional foreign plate coverage has come through equivalent non-US aviation authorities, and we thank many of them for their help in this. In a relatively small (less than 1%) number of cases, there may be a few hand-drawn or "enthusiast drawn" plates in there from various sources that are not 'official.' Quality of the chart various according to several factors. Some charts, such as notably the FAA ones and a few others (France, elsewhere in Western Europe, etc) are beautiful crisp vector PDFs - little works of art in their own right. Other charts are the result of physically scanning paper charts, and the resulting quality there varies from plate to plate. As a rough guess, we'd say that 95% of the current generation charts in SimPlates are nice crisp PDF vector charts, and about 5% are scanned graphics. Of the scanned graphics ones, most are decent, but for some hard-to-find-data-for-locations, such as ex-USSR states and Africa, the quality of the data tends to be lower. The prices on our ourder screen are listed in US dollars. As you go through the order process, you will see in a later screen the price displayed in your local currency. Orders are handled for us by SWreg/Digital River, our e-commerce partner who have been absolutely great at providing a reliable and secure e-commerce gateway for us. Can I order by Phone, Check/Cheque, PayPal, shiny glass beads, etc? Except maybe for the beads, the answer is generally yes. The SWreg/Digital River order system allows for a large number of ways to order. To order, for example, by phone, just start the order process online. Then, when you get to the payment stage, it will ask you about payment method - here you will see the full list of choices. Thank you for checking out SimPlates! "... you have supplied an excellent, thoroughly researched, and well put together product--Thank you!"